There will always be changes that occurs prior to and after some event in your life. There have been some instances that’ll greatly affect your life. It’s been a while since my last post about my law school diaries. At first, it made me feel awkward sharing since I feel shy about this journey. I just have a few posts about this chapter in my life since some may say that I have so much time that I could still blog about it. Here’s a walk-through on my realizations before and after I entered law school. Being a lawyer has been my childhood dream. I have been surrounded by lawyers or law graduates almost all my life. My godmother who practically raised me is a law graduate and she has been playing a big part of my life since. So seeing my aunt’s books greatly motivated me to be work hard and graduate college and soon, enter law school. One of my closest uncles was a lawyer as well. Even if he’s in heaven now, I strongly feel he’s been watching me. Even one of my grandfathers was also a lawyer. Prior to entering law school, I was a Human Resource Management graduate from De La Salle – College of Saint Benilde. Since I was a fresh grad then, looking for jobs was the priority for a person like me. I applied to various companies and hoped to be accepted. There were some rejections and some accepted applications. Adulting is really hard. Accepting the responsibilities and managing your expenses is a tough thing to do. Let alone, getting your dream job! Dilemmas are around to shake us and to let us think that there are so many obstacles prior to reaching your goals. I’ve heard from my friends that they have worked that they have been assigned various positions than what they have aspired for. Those are real stories from real people. I’ve tried working a corporate job but things were different and I think that was the sign for me to pursue mine. I just applied to one school and it accepted me. There were thoughts of transferring but never materialized. At first, I felt walking down an unfamiliar path and just those eyes looking at me. Staring at me. Glaring at me. I felt those mixed emotions like when you are happy and scared about something. As well as when there are butterflies in your stomach. I realized then and there that there’s no turning back. Well, more of either make it or break it. I was down the road of no return.  There’s always a chance to turn back but I did not. I prepared myself myself by watching Suits, How To Get Away With Murder (again). The protagonists would always inspire me to be better, be a critical thinker and be an optimist. That meme is true! 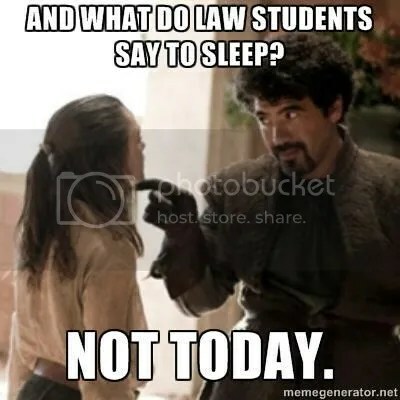 Sleep is practically nothing when you are in law school. The books and cases would usually take most of your time but I don’t think of it that way. It still depends on how you manage things and your time. People wonder how I manage calligraphy, my blog and studies. I just have my planner and my calendar where I plot and strive to plan things out when to do things. Being organized helps, really! Almost in anything that you do, from cooking meals to creating and hosting events. Law school is tough. Really. One learns a lot when go to law school. From being organized to having fun while studying for law school! There will be those who instances that you will feel sad or down but always keep in mind why you started. Don’t forget to still have fun while being in law school. Yes, Adulting is so so hard especially if you don’t like askinf for help from your parents. Ilike to do things my way and I’m not used to asking help. It’s tough and there are times when I just want to run back to them. You’re so lucky that you already know what you want to be eversince you’re little, I am on my early twenties and I’m still at lost about what I want to do with my life. There is a lesson to be learned from the influence of your grandma on your decision eventually to pursue a law degree. Imagine the influence she yielded on you. Now, how do you influence other people with what you do and what you say, today, and tomorrow? I wish you all the best, friend. I recall way back when I was in grade school when I was asked which one should I want when I grow up. I always answer them, I want to be a lawyer, but everything change when I get older. I think the people and your family that surrounds you have given you good influenced to pursue your calling as a lawyer. Oh my, I can’t even count how many times I’ve changes my mind on what to work with for the long haul. But I had this dream with me all the time, that I didn’t really thought was possible (for me), but it was. I’m now working as a full-time entrepreneur. It’s a challenge to figure out what to do with your life, and also manage this adulting thing! 🙂 Thanks for sharing your story! I though I want to be a lawyer too but I eventually took a different path. I’m so proud that you’ve come this far and I’m happy you are still able to pursue your other passion. With your positive attitude and your strong persistence, I know you’ll make it ’til the end. Good luck girl! Agreed. Following a dream is good if one puts the work and Kristine certainly has been doing that. Of all people, I think you are among those who truly understand having shifted from one dream of becoming a lawyer and choosing a different path. So Kristine, good luck! Hi Kristine! I used to dream of becoming a lawyer myself. My grandfather and my dad are lawyers. Now my brother is about to take the exams! I realized it was not for me though, but right now I can relate with you because I’m currently in the DLSU MBA program. Cases and readings it is! I have come to accept that my traveling will be lessened. But I think it’s all worth it. Law school is something big. You’re blessed to have a grandma like that. It’s nice to reflect back about your life. I wish you a good career whatever that will be. Aww, got so inspired by your piece! I’m actually still a computer engineering student, but I wish to pursue law someday, if not a masters and doctorate degree in CpE. I think it’s really awesome how you accomplished your dream of getting into law school. Props to you! 🙂 And I couldn’t agree more with balancing everything with a planner. It works so well for me — I can already juggle work, school, and my blog! As a child, whenever I get asked what I want to be when I grow up, I always say lawyer! Because my godmother is a lawyer too and lagi syang binibida sa mga family reunions LOL. But I never took up law. 😛 Good luck on your studies, it’s hard to juggle studies and passion projects at the same time, glad to know you’re wading through just fine! I would totally agree with you about how hard pursuing or taking Law in school. My sister was also a law student and I see how many and how big the books she was reading. I love books but even I can’t finish a book that I’ve bought and hoarded except for HP books. Right now, my sister is already studying for her bar exams so I hope she passes after all the sleepless nights. I totally believe Law School is hard work. You have to learn so much and remember everything. And the job after Law school will be demanding as well. Love the quote from Suits. That’s an incredible series. And always very inspiring. I watched all seasons and even when you’re not in law school or are a lawyer, there are so many lessons!